Video – La Nova Singers… Blog! La Nova Singers perform Eric Whitacre’s Seal Lullaby, in concert in Bournemouth, March 2013. Conducted by Michelle Nova and accompanied by Celia Cologne. 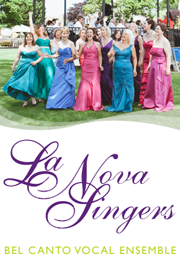 Follow the journey of La Nova Singers as they prepare to perform at historic Highcliffe Castle in December 2012. You can read more about the making of the video on Frit’s blog. This is our first professionally filmed and produced video and we think it’s rather brilliant! Even if it does feature some questionable dance moves. Do you like it? Let us know in the Comments! Our great leader gives her customary Christmas address to the nation, accompanied (naturally) by the festive warbling of La Nova Singers…! P.S. Don’t miss the montage at the end. Everyone loves a montage.